I did pick up a book called "Loose Change" that has a really cute quilt it in, made out of nickels. The plan to start on it was in my mind, but then, I got to wondering. What would any of my internet friends do with all these guys. Does anyone have any ideas they would like to share? Please post a comment and let us know. I am sure there are plenty of us, who could use some inspiration. Lets all share ideas, and see if we can come up with something that will ring our bells! 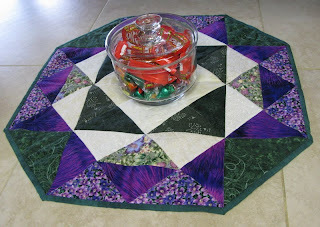 Summer is over and the time is about right to start those fall quilting projects. After all there is nothing better than curling up under a quilt when it is cold to do the binding, right? I love those nights! Look forward to seeing what suggestions we have for each other. Until then I am dreaming of the chilly nights of binding ahead. Can you believe it's September already! Where did the summer go? My goal, the past couple of weeks was to finish up those projects that I started this summer. With the holidays just around the corner, I wanted to clear out old projects before I start on new! With luck that will mean less "PIGS" (projects in grocery sacks) laying around. Notice I didn't say, no "PIGS", that would impossible in my quilt room! :-) Less is the best I can hope for. LOL!! While I was quilting up a few tops, I ran my embroidery machine. With only a few thread changes and long runs, it was very managable to do while I was quilting. 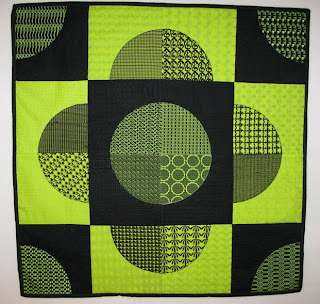 has made it fun and easy to make great quilt designs on embroidery machines now. What a nice change of pace, I don't have to make sure seam allowances are the same thru out. Happy dance, happy dance!!! After careful consideration, I might want to tone it down a bit next time. This one requires sunglasses if you look at it too long!!!! "Screamin' Green" is it's name! Seemed so fitting. But I have finished up a couple of quilt tops. Here is one of them. It's from a class I took earlier this summer. 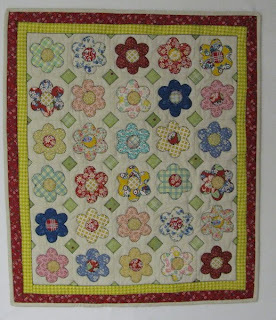 It is the "Island Star" from M'liss Rae Hawley's, More Fat Quarter Quilts. 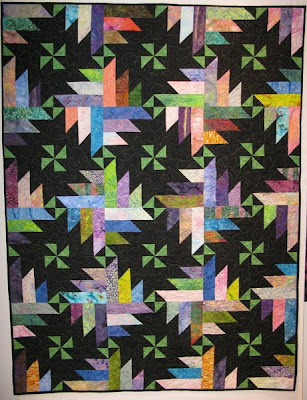 I am pleased to say that every thread in this quilt came from my stash. I had to purchase nothing to complete this. Now that's a red letter day for me, let me just tell ya! 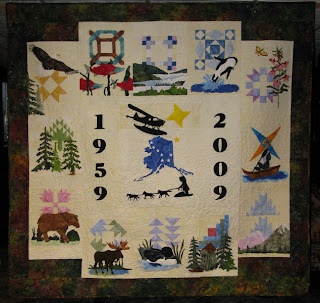 I have also started on my Alaska Shop Hop quilt. I hope to get some photos posted soon. You won't believe how wonderful it is. Great combination of techniques! Hope this keeps you guessing for a day or two!